Here at Two Chimps, we love having visitors. Throughout the year we run an array of different coffee courses both at the roastery and at different venues in the area. Our current coffee courses are listed below. Keep an eye out for more dates that will be added over the year. We hope to see you at the roastery, or at one of our away days soon. To book onto any of our coffee courses, get in touch now. Always been intrigued about coffee and how it’s grown, harvested and roasted? Get involved in one of our FREE coffee schools to find out more! Taste coffee with us, understand how we roast and learn how to brew coffee in different ways at one of our open nights. Watch a roast in progress and see the coffee beans turn from green to brown. Understand how we control the roast to emphasise different characteristics. Find out everything about speciality coffee, how it’s grown, processed and ethically sourced. See for yourself how we roast our coffee with a live roasting demonstration. We finish off the evening with a mini brewing session. This is where you will find out about grind sizes, brewing devices and brewing ratios allowing you to consistently make the best coffee at home. These courses are free to all, but there are limited places available. Book your place now. Always wanted to have your very own coffee? Taste, blend and grind your very own coffee blend in our ‘Create Your Own Coffee Blend’ course. Firstly, you will learn about the coffee we roast and how we roast it. After that, get hands-on in a cupping session with all of our coffees. Lastly, create your blend using a process known as wet blending. After choosing your favourite blend, hand blend your own beans, choose a name for your coffee and create a unique label to go with it. 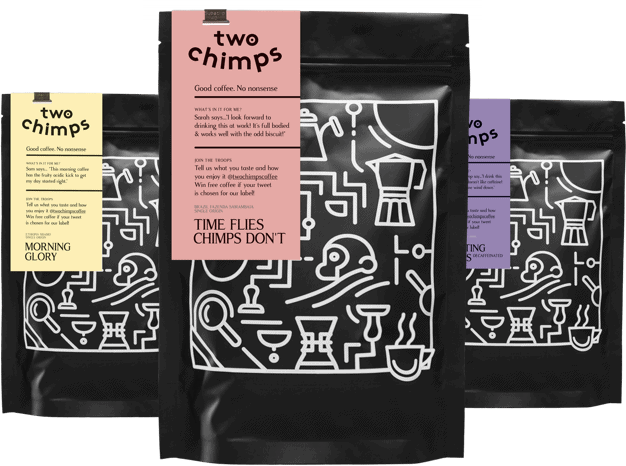 This coffee course costs £25 and includes a 250g bag of the coffee blend of your choice, along with your own custom label. Places are limited. Book your place now. Are you the elected coffee maker in your house? Want to be able to make your fellow coffee drinkers an awesome brew? Get yourself booked on our ‘Barista Basics Coffee Workshop’ and you’ll be a coffee wizard in no time. Your training will start with a little intro as to what speciality coffee is. Then we will move onto what we do here at Two Chimps HQ. After you’ve familiarised yourself with the world of speciality coffee, we’ll tell you a bit about our own coffee roasting process. Now onto the fun part! For the majority of the time, you will be at the espresso machine where we will go through the process of creating an awesome coffee. Finally, the workshop will finish with a ‘drinks-off’. This is where we explain the difference between some popular coffee drinks. You will then have the opportunity to make these drinks with the tips and tricks we have taught you. Book your place here and you’ll be one step closer to being a Barista Champion! So, we know how annoying it can be when you just can’t get your latte art to be how you want it. Our ‘Introduction to Latte Art Workshop’ will turn you into the Picasso of the coffee world. To start, we will show you how to texturise milk correctly. The key is to successfully steam your milk to create a glossy, microfoam texture which we will, of course, show you how to do. Next up, we will give you the secret to pouring. Maintaining, adjusting and controlling your flow of milk are essential first steps to creating your latte art. Once you have the pour on lockdown, we’ll teach you all about the wiggle. In answer to your question, no, the wiggle isn’t the dance your uncle does at weddings. The wiggle is all about the movement of the milk and how to ‘lay’ it on the crema of your coffee. After mastering the wiggle, the latte art you will learn in this basic latte art course is ‘The Heart’. The heart is the simplest latte art to master, but one that’s sure to get heads turning. Lastly, the rest of the workshop is all yours. Use this time to perfect your latte art. Don’t worry if you get stuck; the on-site baristas will be right by your side. Get yourself booked now to make your coffee extra awesome.